work of art and history, seen on television programs, written about by newspapers across the country and chosen to represent the State of Delaware on QVC's Quest for America's Best. Click here for the map's companion piece, which tells more about the map's history and provides a key to the abbreviations used on the map. Fine art reproductions of this significant record of the Mid-Atlantic's maritime history are available in two sizes. This work of history and art by Delaware artist Ellen Rice is the product of a lifelong interest in maritime history and a love of the Mid-Atlantic coastline. More than 15 years of research and over 2000 hours of calligraphy, pen & ink work and water color painting went into the making of this, the first visual recording of the our early nation's greatest ports, its lost ships and rumored "Treasure Beaches." ​"For several centuries, the Mid-Atlantic coastline served as the busiest maritime passageway of the Americas," writes the artist. "Nor-easters, hurricanes and other storms, shifting sand shoals, pirates and licensed privateers made this ocean route among the most hazardous of the New World. 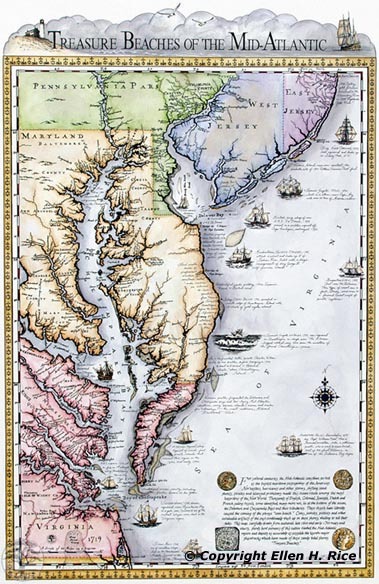 Thousands of English, Colonial, Spanish, Dutch and French sailing vessels, some identified, many more not, lie at the bottom of the ocean, the Delaware and Chesapeake Bays and their tributaries... Coins, jewelry, pottery and other invaluable artifacts of the past continually wash up on these shores, waiting to tell their tales." It was these treasures and their untold stories which first lured Ellen Rice, then primarily a landscape and seascape artist, into the research and creation of the map. Local lore had it that if you walked along the Delaware or Maryland coast during or after a storm, you might find old coins - Spanish doubloons, pieces of eight and other treasures from sunken pirates ships - washing ashore at your feet. Treasure Beaches of the Mid-Atlantic takes the viewer back in time from the Medieval 1500s when Spaniards searched for gold and silver on the shores of the Chesapeake Bay, then called Bahia De Santa Maria, until the mid-1800s and the advent of the U.S. Cutter Revenue Service, predecessor of the U.S. Coast Guard. The artist corroborated every fact on the map. Anything that could not be corroborated was omitted or designated questionable. Several of the ships portrayed were drawn numerous times to assure accuracy as new information came to light. She drew the foundation of the map with information culled from eight different charts and maps from the late 1600s and early 1700s, including an original 1673 Augustine Hermann map personally conveyed to her by its owner. From these time-worn documents came original names of more 2,000 towns, rivers, creeks, Colonial settlements, known pirate's isles and holds, manors, plantations, native American villages, and gold & silver mines from the 1500s through mid-1700s. On no other map in this world is this information combined. A unique treasure map documents a Seaford artist's search for shipwrecks and buried riches. To Ellen, the granddaughter of two U.S. Navy admirals, the creation of Treasure Beaches of the Mid-Atlantic was a way of preserving a part of history and way of life that is fast disappearing at the bottom of the ocean. "The ocean floor and ancient artifacts, which do indeed wash ashore after severe storms, are time capsules of knowledge from which we can learn, " she says. "I hope my map will in some small way help stir further efforts toward responsible research, exploration, recovery and preservation of our nation's maritime history - and more than that - create in our children a lively interest in the lessons history can teach." Accompanying the Captain's Edition of Ellen Rice's Treasure Beaches of the Mid-Atlantic map is a coin replica made from a King George III Rose Gold Guinea found on the shoreline of Delaware's "Coin Beach" adjacent to the 1785 wreck of the Irish merchant ship Faithful Steward (depicted on the map). The original coin is on display in the coastal Fenwick Island, Delaware, DiscoverSea Museum, founded by Dale Clifton, who recovered the coin. The replica coin is 24 Carat gold over solid brass. Each of the coins is engraved on the plain back with the number of the map. There are only 300 of these numbered replicas in existence. The coin is about the size of a quarter. 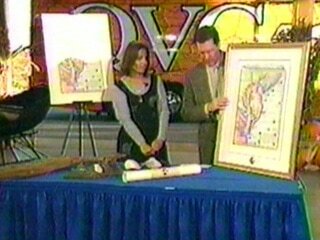 See Ellen's first TV interview about her Treasure Beaches map below.